What did Michal BarOr do with the Pandora’s Box A. has left on her doorstep? Yair Barak describes the circles of guilt engendered by BarOr’s work, A Non-Private Collection, about a stolen suitcase full of photographs, with hope at the bottom. In 2007, three boxes were found in Mexico City, containing some 4500 negatives by Robert Capa, his partner Gerda Taro, and David Seymour, also known as CHIM. The negatives were made during the Civil War in Spain (1936-1939). Among many others, the boxes contained photographs of Federico Borell Garcia, a Militiaman Capa had photographed on the Cordova front at the moment of his being shot to death. This significant historical find demonstrated the gap between the narrative woven by the photographer and “things as they happened.” The box of negatives revealed a lengthy scene in which Garcia was repeatedly falling and rising. A wide-ranging debate regarding the authenticity of the resulting photograph has occupied the discourse for many years. The photographic material found in the box revealed the circumstances of the soldier’s death, showing a direct link between Capa’s photographs and Garcia’s demise, and suggesting that the soldier has been shot while modeling his own death for Capa. Thus the content of that box became an indictment, undermining the idea of authenticity in documentary photography. 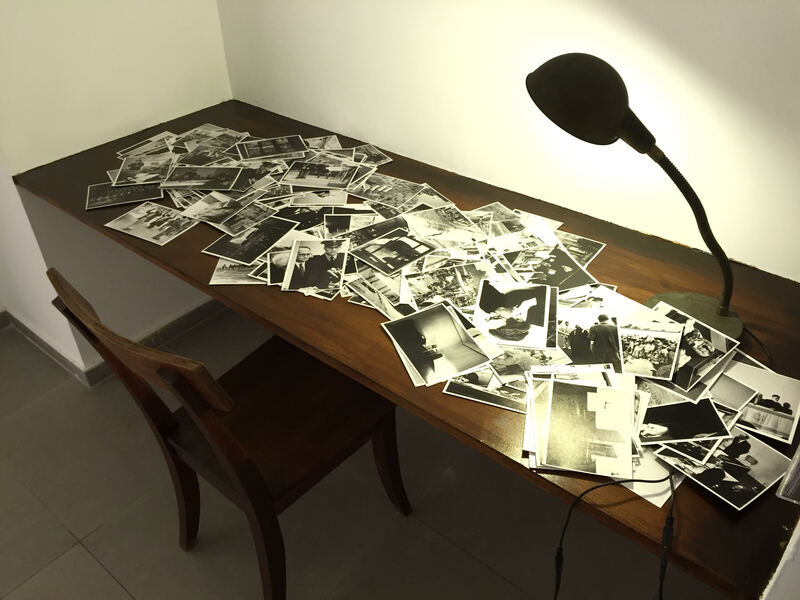 In 1966, A. found a small suitcase containing 260 photographs in an apartment adjacent to his parents’, in Tel Aviv, Israel. These were vintage prints, on glossy paper, documenting key events in the history of the State of Israel: The 1929 riots, the mass emigration from Yemen and North Africa, the War of 1948, and, mostly, dozens of photographs documenting the trial of Adolf Eichmann in Jerusalem, in 1961.The photographs included intimate portraits of the accused, portraits of the judges and the lawyers, as well as photographs of the detention room and the courthouse (the People’s House), during its construction and throughout the proceedings. The suitcase belonged to a man who used to work as a driver for the Government Press Office . A., who lived next door, stole the suitcase one day, when no one was home. Almost fifty years later, in 2015, he approached Michal BarOr and asked her to accept the suitcase. He thought she might be able to “do something with it,” to make use of it in her art, and thus help to ease somewhat the sense of guilt that has been pursuing him all those years. This suitcase, filled with prints, contained numerous indictments of the Zionist narrative and of its evils. It also contained images representing one of the most symbolic, mythical acts of modern culpability: the trial of Adolf Eichmann, the senior official of the executive arm of the Final Solution. It’s difficult to ignore another kind of guilt raised by the philosophical discourse regarding these photographs – the criticism of Eichmann’s trial as described in Hannah Arendt’s book Eichmann in Jerusalem: A Report on the Banality of Evil (Viking Press, 1963). In this book Arendt introduces the idea of “the banality of evil,” antagonizing many by suggesting to view Eichmann’s acts as banal, bureaucratic evil, rather than a monstrous one. So much for the guilt contained in the suitcase. The pile of photographs was originally compiled in an unknown location, by a man who used to live next door to A.’s parents. We do not know (and neither does A.) the circumstances under which the suitcase has reached the neighbor’s apartment, but it is not inconceivable that it had been stolen. The next guilty party is A., who stole the suitcase out of curiosity and perhaps, to some extent, out of a sense of mission. A. was just a boy performing a prank, assailed the next moment by the worry that the object he had taken might contain history-changing documents. The transcription of his conversation with BarOr reveals that he had thought for years that the pictures in his possession had the power to undermine or disrupt everything we ever knew about what had happened here. He also tells of his parents’ small apartment, with its “fake wood” furniture, and of the neighbors’ place, a comfortable, European-bourgeoisie style apartment, “with a large living room and real wood furniture.” When I think of this boy, who was living in mild poverty, being exposed to a different lifestyle, to the latent possibilities of economic freedom, and I imagine the theft as a small act of revenge, a symbolic confiscation of an object pointing to a sense of envy. 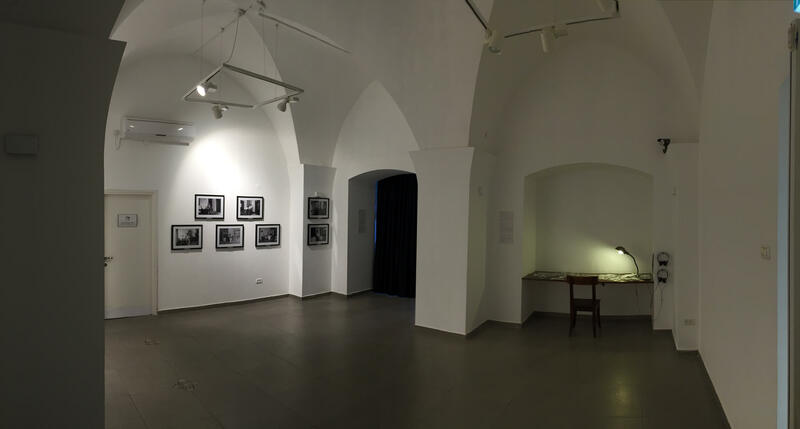 The installation of Michal BarOr’s work – a bare table, very accessible, inviting the viewer to peruse the photographs – indicts the viewer as potentially guilty. The participating viewer, while touching and leafing through the photographs, senses an inherent strain, worrying that the touching and leafing-through might not be legitimate. The viewer does that while wearing a set of earphones which play the story of A.’s confession. Eichmann was also wearing earphones in his glass box, as the testimonies and the accusations against him were translated from Hebrew to German for his benefit (the humane, democratic act of the translation appeared highly ironic in a process whose end was already known. Eichmann was doomed long before he could hear the first translated word). In addition, it is important to mention the way Arendt has discusses bureaucracy in her book. She describes it as the fertile ground for evil to thrive on, and Eichmann is shown as an obedient worker, feeding off clichés. The viewer sitting at the table bearing BarOr’s photographs becomes a bureaucrat too. He leafs through them, inescapably trying to sort them. Even though the attempt to sort photographs is doomed, as Roland Barthes has claimed,2 photography always invites partition and sorting, despite their imminent failure. In BarOr’s work, the sorting viewer obeys the authority of artistic conventions and therefore is guilty– again. A.’s approaching BarOr, and his monologue, which is played in the show (originally a conversation between the two, but the editing has left in only A.’s voice), constitute a modern secular confessional. A., the sinner, approaches BarOr, who has the potential to absolve him. He unburdens his guilt and hopes for salvation. But unlike the Christian confession, where the process is contained within the relationship between the one confessing and the confessor (assuming the latter settles the issue with God), A. passes the sin on. He places the spoils3 in the artist’s hands and hopes that she, in her artistic wisdom, would handle the suitcase appropriately. The suitcase, like the guilt, passes from hand to hand like a hot potato – only no one knows whether it has even been hot. BarOr’s work comprises two elements – one acoustic and the other visual. This familiar scheme is especially interesting in the specific case of A Non-Private Collection. The monologue emanating from the earphones was recorded at a high technical level, with excellent separation, resulting in a very intimate listening experience. The acoustic encounter, image-less, is immediately associated with the above-mentioned confessional, but also recalls another kind of encounter, where the distance between realms of sound and visibility is emphasized – psychoanalysis: the acoustic presence of the talking patient, whose face is invisible, and the visual presence of the listening analyst, whose voice is not heard. The goal in this encounter is to reach the subconscious, to conceptualize the trauma (in this case the injustice and the guilt), but the analyst, unlike the priest, does not absolve. That is not his job. I think of BarOr as a bomb specialist. She takes apart the charge by applying her various systems of representation, and through a mechanism based on a practice of re-representation. Apparently the photographed images in the stolen suitcase include copies of well-known photographs which have been published in various contexts in the Israeli press. The taboo we’ve encountered, the “truth” that, for A., has been banned for many years, is the collective subconscious. As it is being taken apart, the charge is revealed as a dud and its explosiveness symbolically latent. This complex array in BarOr’s work, encompassing the voice of a guilt-haunted person, portraits of an offender against humankind, and photographs of wrongdoing by a criminal humanity, becomes – by the nature of the work – an image. The artistic act turns history into a story, evil into metaphor, theft into an act of poetry. Art is the hope at the bottom of Pandora’s Box; and hope, lest we forget, dwells with vermin and troubles. *The work A Non-Private Collection participates in “Vanishing Point,” a show at Beit Hagefen in Haifa, Israel (curated by Or Teshuva). 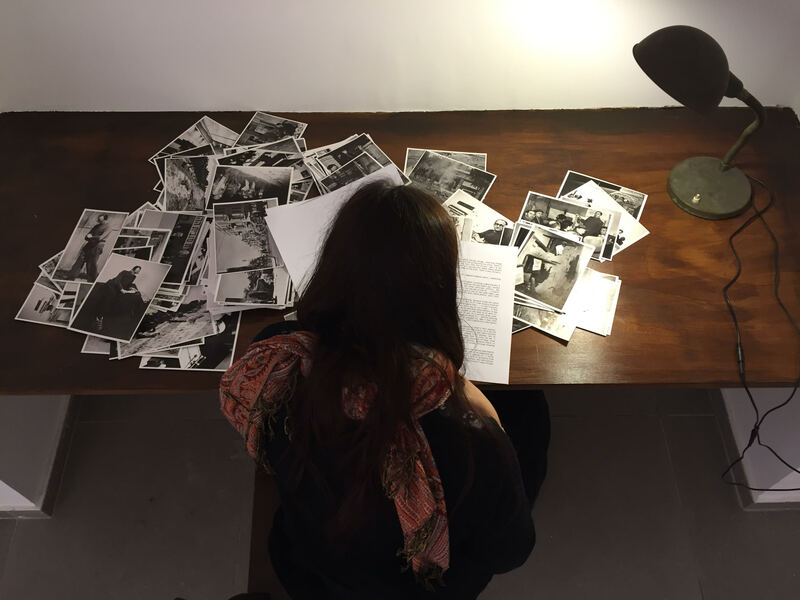 In this work, BarOr placed 260 copies of the photographs from the suitcase on a table. A set of earphone nearby plays A.’s voice, telling his story about the neighbors’ apartment, the theft, and the sensations the content of the suitcase evoked in him during the years he has owned it. 1. The story originates in Hesiod’s Theogony. 3. The term “spoils” is repeated in several of BarOr’s works. She uses it to discuss questions of occupation, power, and the internalization of memory. 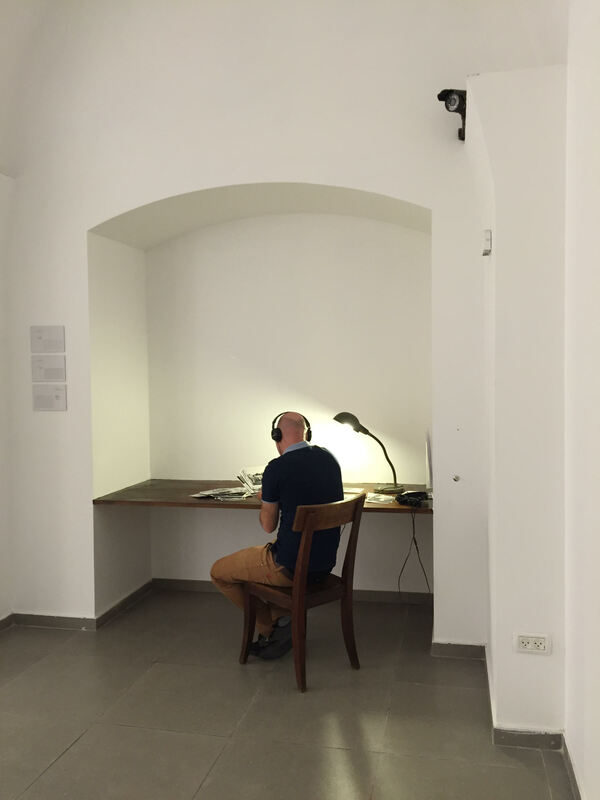 For example, in her show “the Hawks and the Sparrows,” at the Collection Gallery of the Petach Tikva Museum of Art in 2015 (curator: Hlia Cohen-Schneiderman), or in the work Spoils (2015), presented in a group show at the same museum.